It was a heady concoction of vivacious logo mania meets neon streetwear in the alpines for Iceberg’s Autumn/Winter 2019 collection. 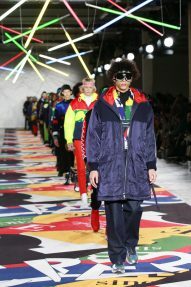 A blizzard of puzzle graphics in primary colours were jumbled together to form a modern interpretation of vintage ski sweaters, while the standout Iceberg logo was dashed across puffer jackets, anoraks, headbands and everything in-between. 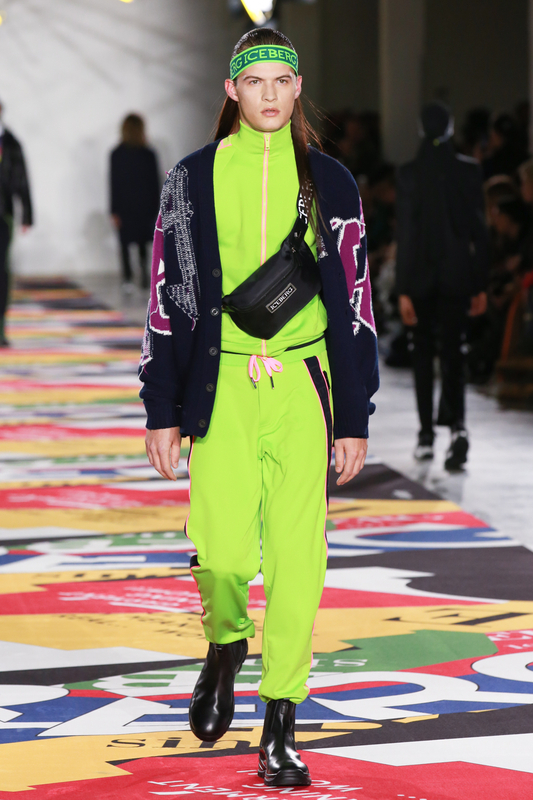 A high-vis acid green tracksuit and stripes galore were made to stand out on both the slopes and the street. Deep purple was another notable colour from the collection aside from the primaries, making an appearance in a velour tracksuit kept cosy under a dusty midnight blue anorak with reflective white stripes. 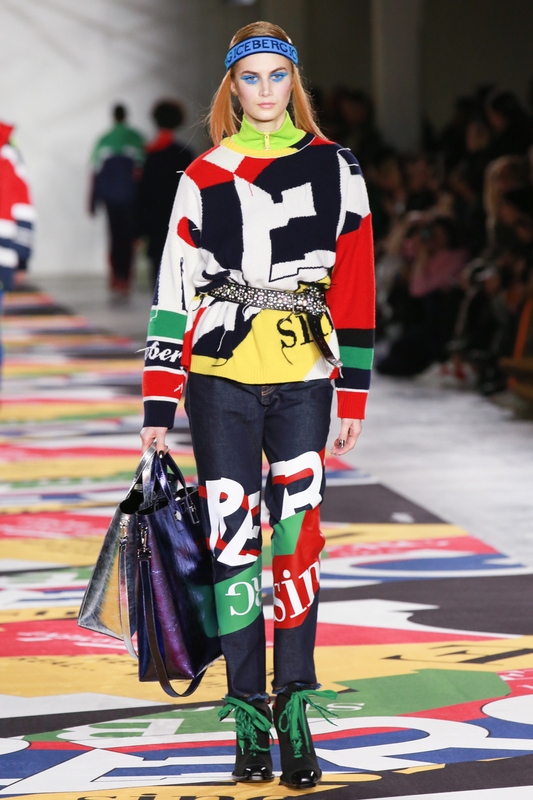 It had the potential to be garish/pimpish, but its ice-cool delivery meant it steered clear of such connotations. 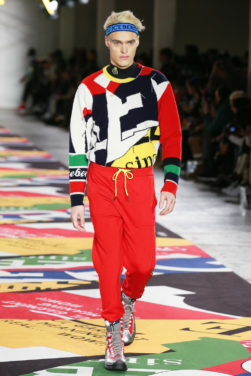 The casualness of the sweatshirts and sweatpants were occasionally interrupted by the odd tailored, more polished look. 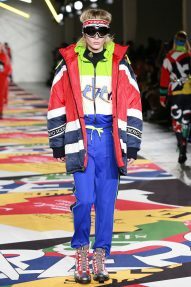 In particular, Après ski, the Iceberg woman, seemed more appropriate for climbing to a last-minute boardroom meeting with sharp tailored jackets and trousers in technical fabrics with logos or stripes, while red and white transcended onto navy relaxed trouser shapes and parachute-like high split dresses. 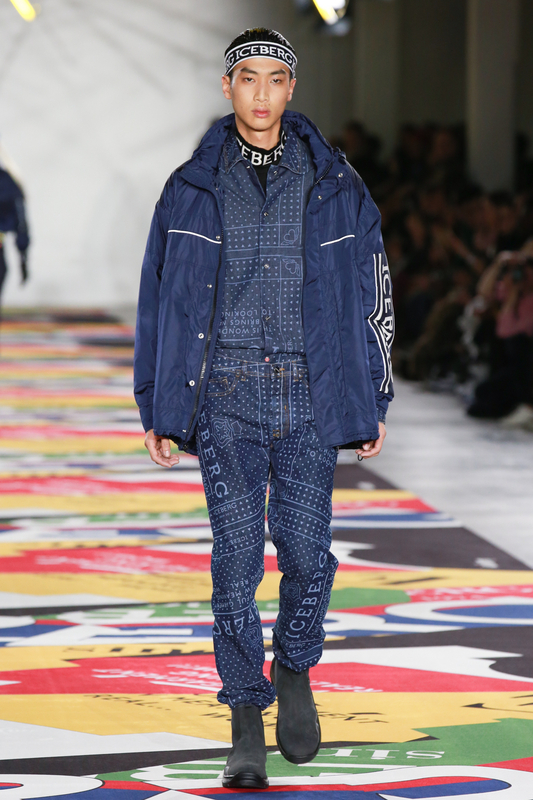 In menswear, a denim tone-on-tone bandana print shirt coordinated with matching loose-fit jeans, reminiscent of the distinctive fashion seen in the early millennia. This was immediately followed by its womenswear counterpart, a rich indigo jean and bomber jacket. 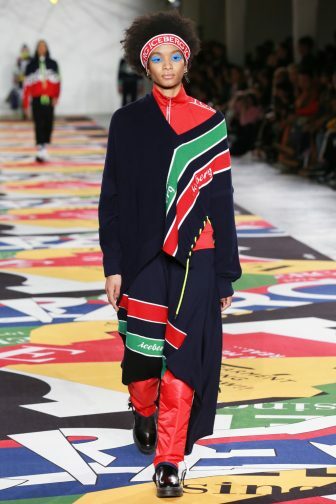 Meanwhile, patchwork tartan shirts and oversized shirt dresses or glows on a tie-neck ladylike blouse worn with matching trousers. 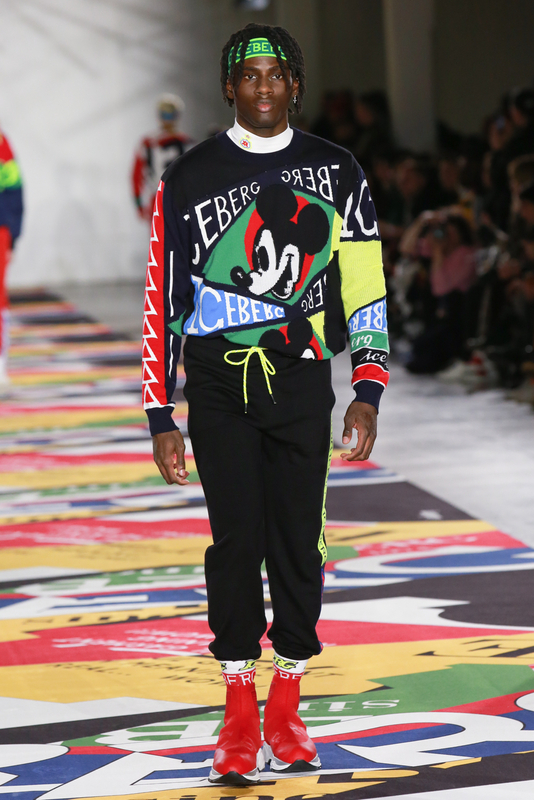 Iconic Disney motifs were scrawled into knitted jumpers and shift dresses, giving a well-loved and often-worn air of nostalgia. 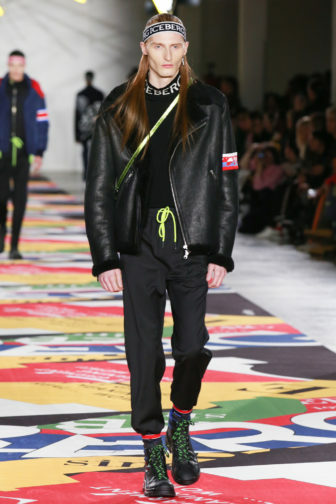 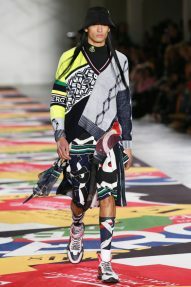 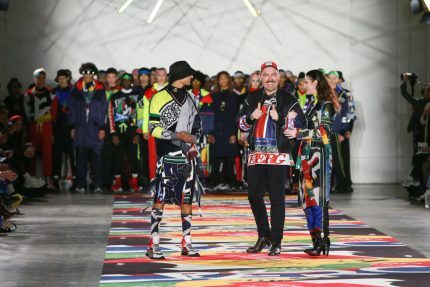 Accessories were appropriately sporty – including waterproof legwarmers, coloured bumbags slung across the chest and footwear such as hiking boots and chunky trainers.